Another topic along the lines of "We don't plan enough." Due to the container plants I've been looking at some vanilla and TR exteriors recently and they made me want to approach our exterior regions in a more planned and regulated way. There is something striking about vanilla- and most TR - regions: They work. They are consistent. Each region has a set scheme it follows, a definite set of flora and other terrain objects and a certain way ground textures are used aswell as a consistent amount and way of using certain objects. Each vanilla region has one or several compelling features that are kept consistent throughout the complete region and are always done the same way. The constant water interruption of the Ascadian Isles, the round hills of the Grazelands, the bogs of the bitter coast. A very simple example are slopes. Depending on the people having made the exterior cell, a slope is made very differently. In some places slopes were cluttered with grass/dirt covered boulders, in other places the slope-rockgroups (grazeland rock retexes) were used, in other places regular blank rocks were used to make it. In some places the slope reveals a rock texture in other places a slope doesn't show anything special. Vanilla- and TR- regions are much more stylized and consistent when it comes to such elements like slopes, what texture appears at what step, what rocks are used in what way, where and how certain container plants show up. If we used a similar way of approaching our exteriors, I think we'd not come across inconsistencies between peoples claims anymore and a region would be more convincing and distinct from neighbour regions. Moreover this could incorporate avoiding implausibilities from the beginning, like mixed usage of covered and blank rocks or mushrooms in places where they don't make very much sense. We should now try to get the style of each region straight and adapt the rest of the exterior file to the outcome of the claims currently worked on. - Overall description of look and major terrain features of the region. This will be a description of what we already have for the most part, but should also include important details that make the region stand out against others. - Description of how the terrain features are created. - List of Ground Textures and descriptions of how and where each texture should be used. - List of the rocks/boulders to be used and a description of how and where they should be used. - List of the trees and plants and a description of how and where they should be used, including numbers for container plants. 4.- Falkar Foothills A - The northern Reach surrounding Mount Snowhawk, acting as transition area towards Haafinheim. 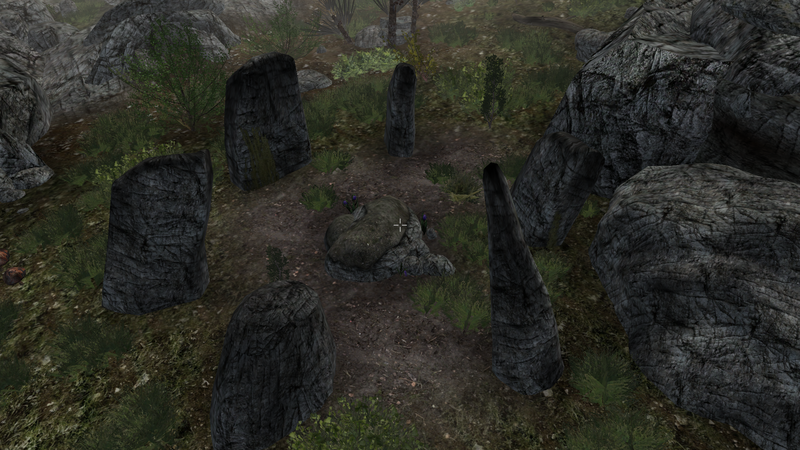 Markarth is within this region setup. --- Falkar Foothills B - The grassland north of Vorndgad Forest but south of the Markarth isle. This includes all of the farmland mesas and the mesa south of snowhawk mountain. --- Falkar Foothills C - Transition area between Falkar Foothills B and Vorndgad Forest A. This is a small area containing Karthgad. --- Aldkarth Lowlands B - Transition area between Aldkarth Lowlands A and the Sundered Hills. Wonderful work, worsas. I've thought about this as well, mostly working with Sundered Hills terrain. A bit confused as I thought the Aldkarth Lowlands region was the region surrounding Markarth and the north of Vorngad. I don't see Falkar Foothills going as south as Karthgad, and for distinctive visual styles I see FF as being dry grass (bright green+orange) and snow patches - something I don't see much more south than same latitude as Markarth. Is that what you are going for with A, B? I like Aldkarth for the area east of KW, but I think we should rather come up with a new region name for the area surrounding Markarth. Perhaps just 'Karth River Region'? I don't know if this post made sense. I feel a bit feverish. But I think we could do with another region. Falkar Foothills for me is the hilly area around Falkirstad and only west of Snowhawk itself. Edit: Perhaps even two new regions - the central grassland between Snowhawk and Dragonstar and the Markarth/river area region. A bit confused as I thought the Aldkarth Lowlands region was the region surrounding Markarth and the north of Vorngad. I thought that lowlands meant the relatively flat land around Karthwasten. The northern areas you mention are not really that low, after all. I'm fine with altering the regions, though. Karthgad doesn't need to be part of the Falkar Foothills region. The way I imagine this, the Falkar Foothills is where the mesas have stopped and only hills will follow while it goes further north. So, yes, it does not make sense to include the farmland mesas within it. But Markarth is already in the area where there are no more mesas. belong to the Druadach highlands. But we should indeed add a new region to contain the farmland mesas, karthgad and Markarth. Yes, I was thinking about how Lowlands didn't make sense anymore a few days ago. How about everything southeast of Vorngad and east of KW = Aldkarth Lowlands, and north of add some new region mostly centered around the Karth, including the farmland mesas. My proposal for region layouts. My apologies for including the markarth isle with the Falkar Foothills. It just makes sense to me to include it as it stands between two haafinheim transition areas, already. First off, I like it a lot from first impression. But it means I'll have to make some alterations on the Markarth concept. I'm not sure if I should add snow patches though. Perhaps on the northern side. roerich wrote: First off, I like it a lot from first impression. But it means I'll have to make some alterations on the Markarth concept. I'm not sure if I should add snow patches though. Perhaps on the northern side. It doesn't need to be within the same region but it should be a continuation of the transitional area west of it regardless. That is because you will always see Markarth and Mount Snowhawk right next to each other. If the island is all green and snowhawk mountain snow, it will look like a very abrupt change from some distance. Yes, I have no problem with that. And I have already begun making Markarth more brown some days ago. Right now it's more of a name thing, stepping outside of Markarth's walls and being in the Falkar Foothills looks wrong to me. Could just call the area around Markarth and that island "Markarth Side". Keeps it ambiguous. Jet133 wrote: Could just call the area around Markarth and that island "Markarth Side". Keeps it ambiguous. Could work, but I'd rather we got a bit more creative. The island on which Markarth is located does not need to be named Markarth. In my opinion that's brilliant. Once the regions boundaries are settled, could we get map with regions names signed on them? That would lower the confusion. Still not too sure. As I said, it could work but I know we can do better. berry wrote: Once the regions boundaries are settled, could we get map with regions names signed on them? That would lower the confusion. One of the reasons why regions work so well at TR is because the region concept usually comes with a file containing just a few cells with concept landscape work, which everyone can refer to. I did the same thing for the Southern Gold Coast at P:C, worked very well. We should definitely use small cutouts from a first region claim as concept files for reference purposes. Thank you for speaking up on this, Worsas. Someone needed to make this thread. I've felt for some time that our lands lack strong region divisions, causing landscapes to get jumbled together into a single continuous geographic area, rather than distinctive separate ones. I just couldn't come up with an articulate way to voice my concerns. You did, and for that our project owes you major gratitude. Personally, I think it's important that our sub-regions look like cohesive parts of the same region. If the player is exploring the Druadach Highlands, he or she should recognize it as the same visually distinct region, whether they are located in its A, B or C variants. It's also important that we don't create regions that are too small to stand out. We should try to match the size of the ones seen on Vvardenfell. That means we should try to avoid creating mini-regions just to fill geographic holes, in my opinion. I'd say the Falkar Foothills shouldn't be snowy, except very close to the border with Haafintheim and in cells neighboring Mt. Snowhawk. This is a neighbour region of the Sundered Hills and should share many of its features, except being grassy and fertile. Terrain: Pretty much as it is now. Mostly flat and expansive, possibly with a few more small cliffsides. Rock usage: Cliffs and blank rocks. No grass/dirt boulders or - rocks. Similar rocks and rock density as seen in the Sundered Hills, only a bit less. Trees, bushes and grass: The same trees and bushes seen in the Sundered hills and in similar density but non-dead. Grass mostly as it is now, but with a major population of Sky_Flora_Grass_04_01 and Sky_Flora_Grass_05_01. Container plants: Dragynia, Persarine, Shadow Fly and wild growing Wither Wheat. Silver Palms in the near of the Hammerfell transition area. Mushrooms only in shaded, humid spots. Forsythia Tromja in the near of the Sundered Hills. In average 30 container plants per cell. An inhospitable, barren region in the southern Reach with countless rocks and abysms. Terrain: Pretty much as it is now, possibly a few more minor hillls with cliff ranges. Rock usage: Exactly as it is now. Only blank rocks and cliffs. Trees, bushes and grass: The same as it is now. Container plants: Aspyr Tea, Forsythia Tromja, Tremble Weed aswell as Cave Lichen. 15 of the container plants in average per cell. The lichen can be many more since they will always be small and hidden. 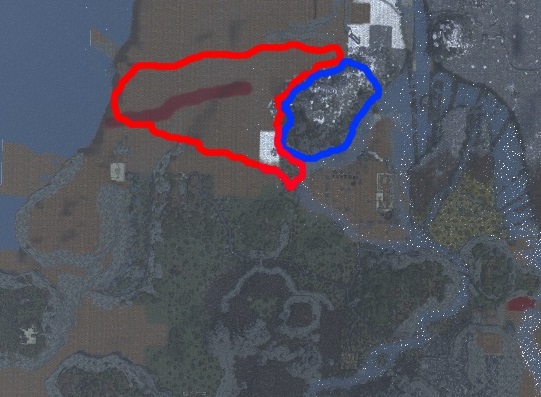 Consisting of two subregions stretching across a far area in the west of the Reach. One of them being grassy, the other one being brown with mostly dirt and dirty grass ground. Terrain: A lot of vertical variation in the grassy subregion with many cliffy hills. The dirt subregion only found on top of the border mesas, being big rocky expanses. Rock usage: Each slope should either consist of a cliff or be cluttered with grass or dirt boulders/rocks and many small rocks. The top part of Grass/dirt boulders and - rocks should always stay connected to the surrounding terrain. The bottom part should accompanied by rock groups. The grass/dirt boulders with the flat lower side should be preferrably accompanied Sky_Terrain_Rocks_04_03-04 or Sky_Terrain_Rocks_Grassy_04_03-04 depending on whether we have a dirt or grass- boulder. Sky_Terrain_Rock_Grassy_04_36 or Sky_Terrain_Rock_04_122 are possible additions to those flat rock groups. grass- or dirt rocks with a higher lower side are accompanied by less flat rocks. The lower side of grassy terrain edges can be decorated with bitter coast moss. Also, there should be a significant network of exterior caves found in this region. Trees, bushes and grass: Several minor groves scattered across the region. Also, the grassy subregion should contain many more bushs and shrubs than any other other grassy areas, so it should be nearly a bushland rather than a grassland. The relation of of Sky_Flora_Grass_Shrub_02_02, Sky_Flora_Grass_Fern_01_01 and Sky_Flora_Grass_Shrub_05_03 to regular grass should be roughly 1:1. -117, 13 is a good example for both things. Container plants: Wrothgarian Grape, holliberries, Silver Palms, Vicar Herb, Trembleweed and wild-growing apples. The brown subregion also features Aspyr Tea, but should lack apples, holliberries or grapes. Mushrooms only in shaded, humid spots. Average of 25 container plants per cell in the grassy and 20 in the brown subregion. A grassy region northeast of Vorndgad Forest with a lot of agriculture. Terrain: Like the terrain in the grassy part of the Druadach Highlands. Rock usage: As in the Druadach highlands, except without exterior caves. Trees bushes and grass: Much less bushy than the Druadach Highlands and no groves. Tree and bush distribution mostly as it is now. The grass distribution should be clearly dominated by Sky_Flora_Grass_01 and Sky_Flora_Grass_03 aswell as Sky_Flora_Grass_Shrub_05_03. Container plants: Wrothgarian Grapes, Holliberries, Persarine, Vicar Herb and wild apples. Mushrooms in the humid and dark spots. An average of 30 container plants per cell. 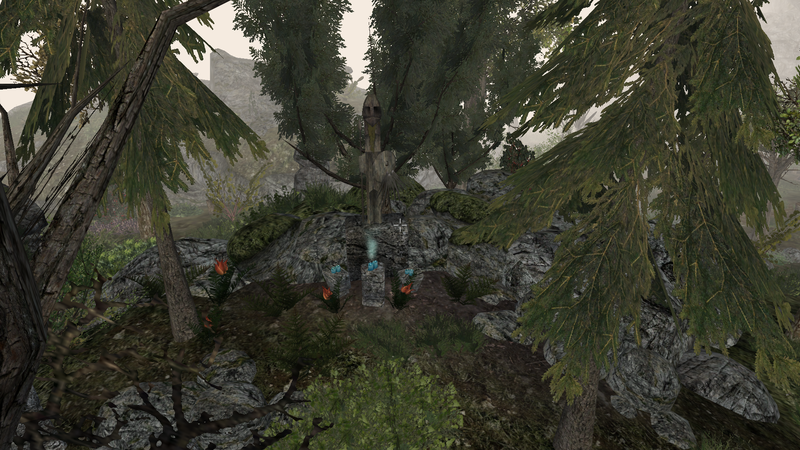 The mixed forest in the center of the Reach. Terrain: Should remain as it is now. Rock usage: Slopes should either be cliffs or be cluttered with leaf/grass-covered rocks and boulders. In flat canopy-covered areas, there should exclusively be leaf-covered rocks or if there are blank rocks, they should be partly covered by leaf piles. The amount of rocks should be similar to that in the Farmlands region or the Aldkarth Lowlands. We might want to think about adding exterior caves in this area aswell. Trees bushes and grass: Tree and bush distribution as it is now. Only they should give way to more rocks in many places. Grass- and shrub distribution as it is now, but with a significantly bigger population of Sky_Flora_Grass_Shrub_Small_05. Container Plants: Honey Lilly, Taragetis, Persarine, Shadow Fly, Vicar Herb and holliberries. Mushrooms can be placed everywhere. An average of 30 container plants per cell. 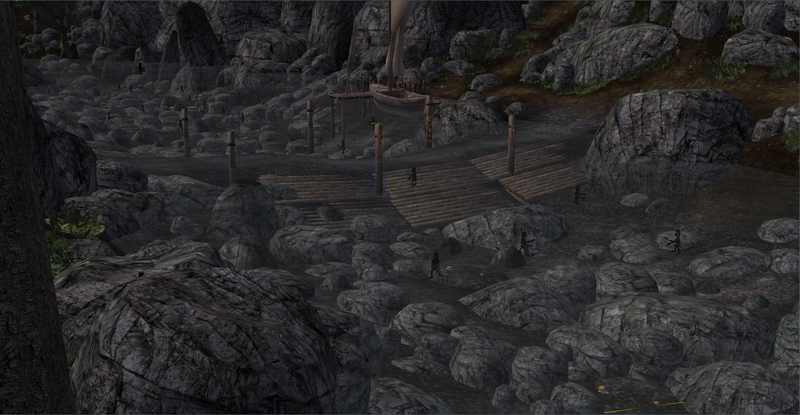 The area in the mostnorthern Reach surrounding Mount Snowhawk and, stylistically circumpassing the Markarth island. Terrain: Other than the Rest of the Reach the Foothills should be no more mesas and cliffs but rocky hills that visually underline Mount Snowhawk. Rock usage: Blank rocks, possibly terrain edges with dirt- and grass- boulders/rocks aswell. Trees, bushes and grass: Mixed usage of Reach- and Haafinheim trees depending on how far north it is. Mostly pines and few dedicious trees. The pine bushes found in the further south areas should be very frequent here. Grass distribution in the southern area matching the one of the Farmlands region except more sparse, the north being populated with Sky_Flora_Grass_Dry_01 and Sky_Flora_Grass_Shrub_Medium_02. Container plants: Holliberries, Vicar herb and mushrooms. Maybe a new container plant aswell. An average of 15-20 container plants per cell depending on the area. One key thing we should try to get settled now rather than later is the composition of container plants in each region setup. I have made a proposal above, but we should maybe try out what container plants actually look the most fitting together and within the region itself. Each region should feature at most 5 different plants next to mushrooms, so that each region offers something different. We should try to get this straight within the exterior claims being finished. It doesn't need to be the same composition as proposed above, but it should be a clear and limted range of plants that sets the region sufficiently apart. It is not a mere consistency obsession on my part but a thing of gameplay, if you can find certain plants in certain regions rather than everywhere you go. I like your proposals, Worsas, though I can't say I "feel" other regions than Druadach highlands yet (obviously, as I have been spending my project days in this region only ) and know little about them. I have been trying to get my claim's vegetataion look accordingly to your outlines ever since you posted them. worsas wrote: One key thing we should try to get settled now rather than later is the composition of container plants in each region setup. I have made a proposal above, but we should maybe try out what container plants actually look the most fitting together and within the region itself. Each region should feature at most 5 different plants next to mushrooms, so that each region offers something different. We should try to get this straight within the exterior claims being finished. Holly bush may sometimes play the same role as wrothgarian grape, as it has nice, diversified models that can be scaled (unlike grapes) almost up to 2.0 without looking stretched; their colours liven harsh countryside of the Reach. Mostly though I imagine they should be the basic flora of the groves and other shadowy spots of the region. They have that forest feel with them + they were already used that way on Solstheim. Apple trees look good when placed in open space as well. They can be solitary or grow in small wild orchards (2-3 trees + few small rocks + some Sky_Flora_Bush_Pine_02_); there should be fallen apples lying on the ground by some of them, the ones closest to Reachmen villages should be taken into custody by Reachmen (with their apples collected into baskets and so on). 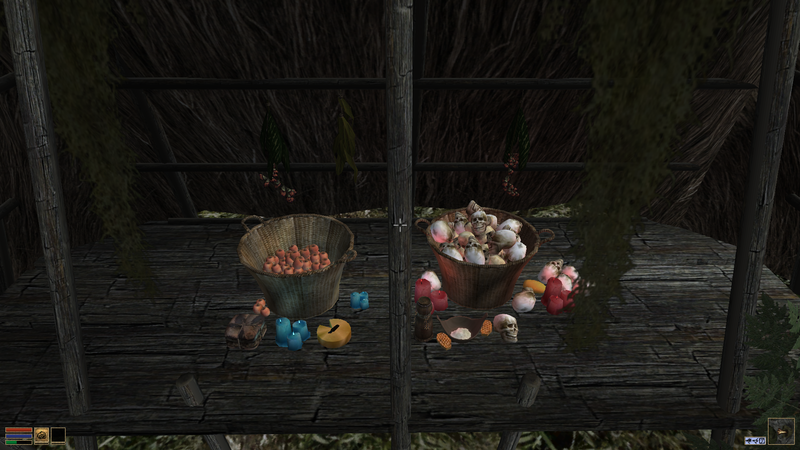 In my opinion apples looks best when pust on Tx_Skyrim_Grass_Dirt_03 terrain. Silver palms - nothing revealing here. I believe they should either grow in groups on Tx_Skyrim_Rocky_Dirt_04 pieces of terrain, or grow on grass in single numbers. They can be scaled way up. Trembleweed - mostly on dirt, by rocks, but I think it looks good too if scaled up and used as a bush on grass terrain, just not too often. I really like it's harsh, alien look, and I think players would enjoy it too. The same with Vicar herb - though in contradiction I would say it is mostly grass plant. I imagine it could grow on groves borders, perhaps? Mushrooms - rust russulas and black spore cap, obviously growing by rocks or in groves. As I stated before, I'd like us to keep king boletes in this region as well, though in very small numbers and only in forested areas of the region. I think some shelf fungi (perhaps black spore cap variant?) would be nice addition here too. It's how it looks as for now, though I'm open for discussion on that design. I like the look of the grassy druadach highlands very much. Three different mushrooms including the king bolete are alright, but I object against introducing a shelf fungus. I think it wouldn't look good on these trees and we already have very many different container plants as of now. The lichen are fine as an occasional thing. If you were to do without Persarine and Honey Lilly in this region setup, we would still be going by 9 different plants (excluding the mushrooms), which is still very much. Keep in mind that the other regions should be given the chance to stand apart by using some of these interesting plants. Otherwise the Druadach Highlands might rule out the other regions completely. All in all your claim and the Druadach Highlands A - setup looks pretty much completed except of the container plants issue. Perhaps try to get rid of two more plants, possibly the apple tree and the Taragetis and it should be fine. Sundered Hills. but will also be found in Falkreath. Aldkarth Lowlands. Will be found in Falkreath aswell. That village borders Aldkarth Lowlands, so I believe they won't look off. I'll make them fit. Taragetis is on the other hand easy to replace. I like that. It's great how you can see now each region would have different feel to it. Do you think shadow fly should be used more often now, when there are hardly any other flowers for Druadach Highlands? Or would they rather be replaced with vicar herb, mushrooms or nothing at all? Though I don't think blank rock groups would be good for this region. Also, I suggest that most (if not all) apple trees in Aldkarth Lowlands region would be wild, alike to what I was trying to carry out untill now for DH A, while most (if not all) Farmlands apples would be domesticated. But I'm sure I'm not being Columbus here. I'm totally fine with everything you do as soon as we have a general consensus and we overall follow our own guidelines. A few exceptions shouldn't be a problem because the regions still won't be as strictly different from each other as they are in the vanilla game in the end. I think I finally like this proposal for container plant assertion and will be using it to finish my claim. Roerich was fine with it aswell. It's up to you. If you have a few less container plants, collecting ingredients will be more of a challenge and fun for an alchimist character. That's the biggest reason for lowering the container plant numbers per cell. Shadow Fly could be a little bit like the Dragtails in the vanilla game, of which you could hardly get enough samples gathered. Overall the Druadach Highlands shouldn't be a particularly flowery region. But feel free to add a few more shadow fly flowers, if it feels right to you. But don't add loads of them just to have a spot cluttered, that's what non-container plants are for (if that's what you mean with having blank rockgroups otherwise). - The western canyon should probably get a reachspeech name. - Farmland region could get a relatively generic name, but it should not end up being called farmlands. I would like to reduce the area covered by fields here aswell and reduce the several hovels on the eastern mesas so they occupy less space, so we can possibly have a ruin in that area. This seems important to me, still. Unfortunately, the way the Reach has been designed thus far doesn't offer us many possibilities to "unify" or combine regions (since they are too distinct). There probably should not be something like a Farmland region or a western canyon region though, they're too small. The canyon seems to be a bit of a transitional area anyway, so it might as well belong to the Highlands region. Scamp wrote: There probably should not be something like a Farmland region or a western canyon region though, they're too small. The western canyon can well be omitted. it would have been identical to the druadach highlands, except for the little wetlands anyway. The farmlands region is the large horizontal, yellow-marked streak of land south of Markarth. Definitely big enough to deserve an own region. Oh yeah, I somehow got something mixed up there. Looks good, then - although it could have a better name indeed. 1. Are Bjoulsae Rose deliberately missing in regional flora listing, meaning they are reserved for domesticated usage solely? I'm sorry if that's the case, I wasn't able to find any info on that matter on the old boards. I was thinking they could come in handy in Aldkarth Lowlands region - there are plenty of them in Karthwasten, belonging to this region, and the Lowlands currently don't have any bush in their setup. I know we want to emphasize the difference between the Lowlands and Druadachs that way, but some wild rose bush here and there shouldn't matter that much, I bet it'd rather highlight the difference, as Bjoulsae's colour palette contrasts with Hollies'. Plus - we agreed on having apple trees growing wild in this area, while they are gardened by the people living north from here. I can't see why it couldn't be the same with the Bjoulsae Rose bush. 2. I already expressed that thought in Roerich's Markarth claim, but I think it should be considered worldwide, especially since it won't require that much work - I can get it done myself, so don't worry about manpower here - and since we want to revisit finished exterior claims in release area. I.e. by the river's source between Karthwasten and Granite Hall. I can't actually be the only one believing that river should be approached by locals as awesome trade and travel route, especially how there are many scoundrel beasts in local forests that can one-hitly take down an average human. 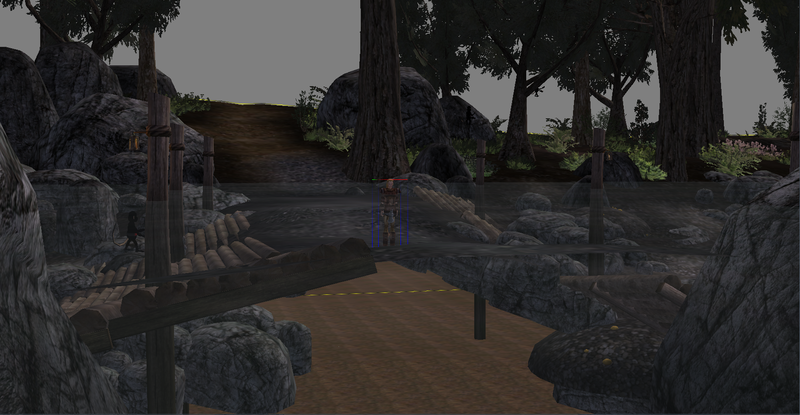 The Nord lady is standing in the deepest part of the ford, the same spot where the boat crosses it. Wooden lanterns on the poles mark the sailing road for the river captains. edit: we could actually make a TG or something quest out of it, where player has to misplace the lanterns on some passage to cause certain ship to wreck. And yeah, I know there was a pretty similar quest in TES V.
Another edit: By the way, I imagine very similar walkway-constructions - only erected above water level - to be used for a few main routes in Hjaalmarch hold, that together with some docks and hidden dirt paths through the swamp the sparse would create the sparse road network of this region. Another great usage of it is some exterior caves and breaches. Seems fitting too. I agree with all your points, berry. Having an inland port village near Karthwasten would make a lot of sense, something I've thought about a few times before as well. Especially considering the status of Karthwasten as a major trading town - linking KW to the Sea of Ghosts via the Karth river should be a no-brainer, especially after the annexation of the city. I know this was probably intended or implied already, but having a port for Karthwasten would be a very nice addition IMO. 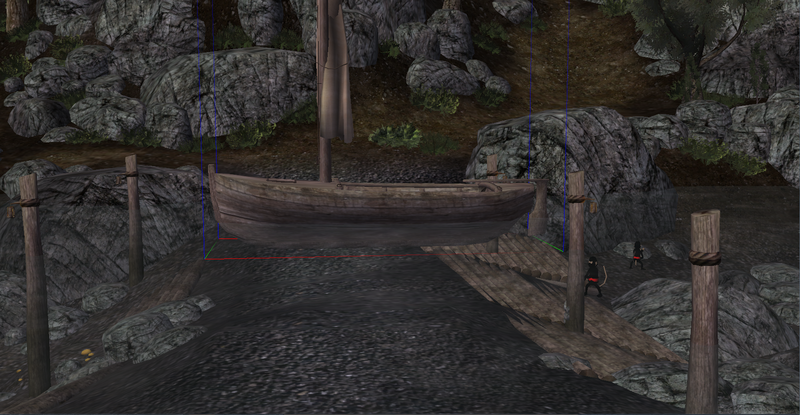 4-5 Redguard houses and a dock, perhaps even a ship transport to Markarth. The location you picked seems good, there's not a lot of points of interest in that area so far either. And nice ford! I would find it better, if we didn't use the Bjoulsae roses in any of our regions. Roses don't belong into the Reach, in my opinion. They should be purely domestic plants from highrock. Maybe it would be better to name the rose after a highrock town, too. Nord women are supposed to use perfume made from roses in a throwaway lore reference somewhere. French Ninja was quoting something from somewhere. But I think that could be an imported good, like the Wasabi. Fine with me, although a bit weird to have a completely different soil in a place like that. In my opinion it doesn't contribute much, because the cultic sites are already very eye-catching as they are.